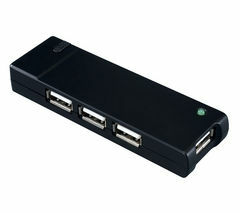 USB hubs are a clever way of expanding your USB capabilities at a minimal cost. When working on a laptop especially, USB ports can be short in supply and high in demand, meaning you often have to choose between which of your computing accessories to use. The USB hub solves that problem with ease. 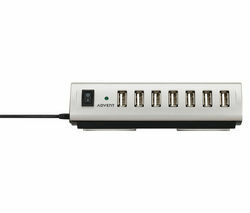 Simply plug your USB hub into a USB port and, much like a plug socket, you’ll have more ports to use. Our range of Advent USB ports offer great affordability, with prices starting at under £10 for a four port model. If you’re presenting in meetings then a Wireless Presenter is a great bit of kit, enabling you to wirelessly move between slides with a small and smart remote. Our Selection of Belkin USB Hubs also offer brilliant performance and slick design. The Belkin ultra slim USB hub, which can be used with PC or Mac,has seven ports and a slim design for ultimate compatibility which is perfect for the home or office. It also weighs just 362g making it small and lightweight enough to travel with hassle free. With a USB port you also have your USB plug-ins in one place to keep your computer area tidy of wires. Whether you’re kitting out your home computer with extra accessories or re-organising your office desk, a USB hub is the perfect solution.